CloudHost – Responsive Hosting WordPress Theme Created by OceanThemes. 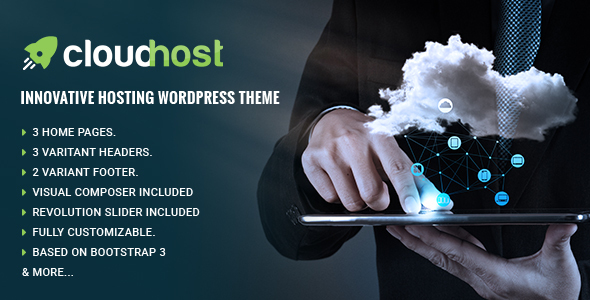 This templates have specific characteristics, namely: CloudHost is an Elegant WordPress Premium Theme, It?s fully compatible with WHMCS-Bridge plugin which connect between WordPress and WHMCS, CloudHost is suitable for Hosting websites aswell as Company, Agency or Organization . You can use this CloudHost – Responsive Hosting WordPress Theme on WordPress category for business, corporate, domain, host, hosting, hosting theme, modern, page builder, technology, web hosting, whmcs and another uses. 3 predefined homepage layouts: all homepage layouts are included in demo content file. It will help you a lot to build your homepage. Advanced Theme Options Panel: CloudHost comes with powerfull Theme Options panel. It helps you a lot to adjust almost everything you need.